We’d love your help. Let us know what’s wrong with this preview of Hawthorne on Painting by Charles Webster Hawthorne. Look around and select a subject that you can see painted. That will paint itself. Do the obvious thing before you do the superhuman thing. It may have been accidental, but you knew enough to let this alone. The good painter is always making use of accidents. Never try to repeat a success. Swing a bigger brush — you don’t know what fun you are missing. For 31 years, Charle Look around and select a subject that you can see painted. That will paint itself. Do the obvious thing before you do the superhuman thing. For 31 years, Charles Hawthorne spoke in this manner to students of his famous Cape Cod School of Art. The essence of that instruction has been collected from students’ notes and captured in this book, retaining the personal feeling and the sense of on-the-spot inspiration of the original classroom. Even though Hawthorne is addressing himself to specific problems in specific paintings, his comments are so revealing that they will be found applicable a hundred times to your own work. The book is divided into sections on the outdoor model, still life, landscape, the indoor model, and watercolor. Each section begins with a concise essay and continues with comments on basic elements: general character, color, form, seeing, posture, etc. It is in the matter of color that students will especially feel themselves in the presence of a master guide and critic. Hawthorne’s ability to see color and, more important, to make the student see color, is a lesson that will aid student painters and anyone else interested in any phase of art. Although it does not pretend to be a comprehensive or closely ordered course, this book does have much to offer. It also represents the artistic insight of one of the finest painter-teachers of the twentieth century. To ask other readers questions about Hawthorne on Painting, please sign up. An interesting and quick read. Hawthorne was, I believe, the founder of the Provincetown Art School and a teacher for over 30 years, well-loved by his students. This book is an attempt to capture some of his teaching magic and was published after his death. His paintings can be found in museums in the US that has some depth in American art after the previous turn of the century. My local museum, the Toledo Museum of Art, has a nice painting of his, though it is rarely on display as his star powe An interesting and quick read. Hawthorne was, I believe, the founder of the Provincetown Art School and a teacher for over 30 years, well-loved by his students. This book is an attempt to capture some of his teaching magic and was published after his death. His paintings can be found in museums in the US that has some depth in American art after the previous turn of the century. My local museum, the Toledo Museum of Art, has a nice painting of his, though it is rarely on display as his star power as a painter seems to have waned over the years. I'm not a painter but read the book because of an interest in art history generally and specifically an interest in Margery Ryerson, one of Hawthorne's students and apparently the one who took down the notes and compiled her teacher's comments into a generally coherent text. There are some very inspirational passages from Hawthorne that would appeal to anybody, not just aspiring artists, advice that could be translated into any artistic or spiritual aspirations. The book captures an excitement in his teaching that must have been incredibly nourishing for his students, as well as a candor that could have been intimidating. A large portion of the book is documenting critiques that he had of student works. This part of the book can drag given that we don't see any of the images that he is critiquing. You do get a sense here that he was truly an honest teacher, unafraid to praise or trash a student. This book offers good advice on how to approach painting in a very philosophical way. Practical advice mixed in with C. Hawthorne's brilliant descriptions of how to open oneself to seeing and looking more attentively. A great collection of things to ponder for an artist at any age. Are you intrigued by the subject, have you shown this? Though I have not been a fan of his work (by ignorance to his work only, I assure you), I am a fan of his words and gusto. Passion, poetry and preaching is painting. Each time I read this one, I pull more and more from it. Highly recommended for any 1 looking for a great book to read on painting process or technique. It deals with the approach and skill both in a very fundamental and unique way. Lovely, not as dated as you would imagine. He restates fundamental principles of seeing and recording. 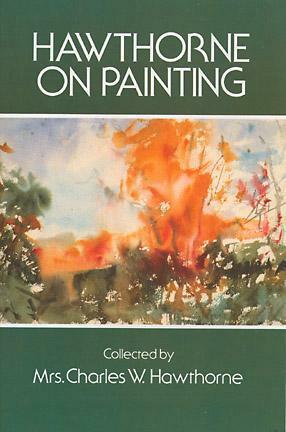 Great book for students of painting. Full of the things I try to remember when I'm painting. Love this art book.